The Siona, Secoya and Kofan indigenous peoples have been living with the consequences of oil drilling in Ecuador’s northeastern Sucumbíos province for several generations. Many communities say the oil industry has polluted their sources of water for drinking, cooking and bathing, with grave consequences for their health. With the communities, the Ecuadoran government and the U.S. oil company Chevron locked in legal battle over who will pay for a cleanup, and oil still being pumped from beneath the rainforest, the communities are now forging a path around their pollution problems. Indigenous communities, with help from a U.S. NGO, have installed more than 1,100 rainwater collection and filtration systems in 70-plus villages to supply clean water. They’ve also set up dozens of solar panels to ensure ample electricity that does not rely on the fossil fuel industry they say has irreparably harmed their home and way of life. LAGO AGRIO, Ecuador — Nemonte Nenquimo covers her face and squeezes her eyes shut as a pungent whiff of petroleum hits. She’s digging with a pole into an unmarked lagoon of sticky crude in the middle of the jungle. A lifetime in Ecuador’s most pristine rainforest has left her ill-prepared for the harsh odor to which most of humanity has become accustomed. 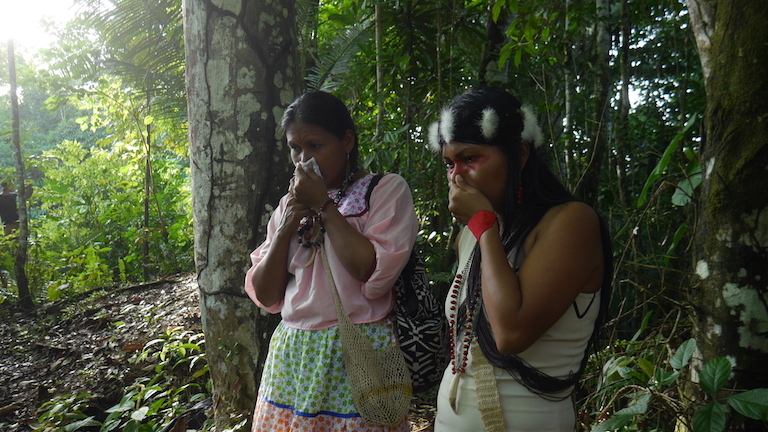 A 33-year-old indigenous Waorani from Ecuador’s southeastern Amazon, Nenquimo says her home territory has so far narrowly escaped the intrusion of the country’s growing oil industry. Her intimate knowledge of the Amazon’s biodiversity makes her visit to her fellow native people’s oil-polluted territory here in the forest surrounding Lago Agrio, the capital of Ecuador’s northeastern Sucumbíos province, all the more poignant. Nemonte Nenquimo, right, and Flor Tangoy cover their faces as the smell of disturbed crude oil rises from a polluted swamp in the rainforest outside Lago Agrio, Ecuador. 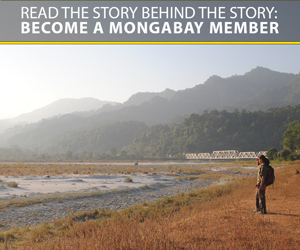 Image by Dan Collyns for Mongabay. The Siona, Secoya and Kofan nations have been living with oil in this area for several generations. They are among the 30,000 plaintiffs in a huge class-action lawsuit against the U.S. oil giant Chevron, a case that recently marked its 25th year. The case is about one of the world’s most notorious environmental disasters. The U.S. company Texaco Petroleum was active in the region between the mid-1960s and 1992. During that time it produced, along with a lot of crude, more than 68 million cubic meters (18 billion gallons) of toxic waste water loaded with heavy metals and carcinogens, according to scientific studies commissioned by the plaintiffs. Flouting the environmental standards it would have had to uphold back home, the company, acquired by Chevron in 2001, polluted an area bigger than the U.S. state of Rhode Island, the plaintiffs claim. 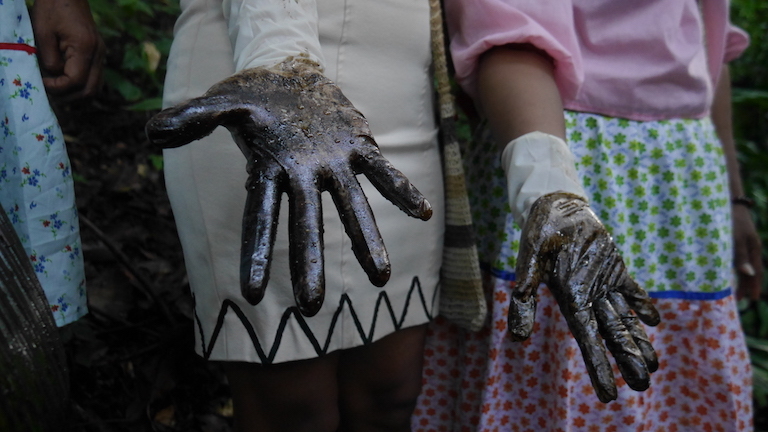 Crude oil covers the gloves of Nemonte Nenquimo and Flor Tangoy after they dipped their hands in a polluted swamp outside Lago Agrio, Ecuador. Image by Dan Collyns for Mongabay. An Ecuadoran court ruled in 2011 that Chevron had to pay $18 billion for reparations and a cleanup, a figure reduced to $9.5 billion this August. The company, which has no assets in Ecuador, has fought enforcement of the ruling abroad, and has never paid up. Chevron maintains that the Ecuadoran government absolved Texaco Petroleum of further responsibility after it performed a $40 million cleanup in the 1990s and then failed to complete the cleanup itself as promised — a position that the Hague’s Permanent Court of Arbitration supported in a ruling in September. For its part, the Ecuadoran government has said it will appeal the international tribunal’s ruling. Meanwhile, Ecuador’s state oil companies and foreign multinationals continue to pump oil in the region, and oil spills continue. 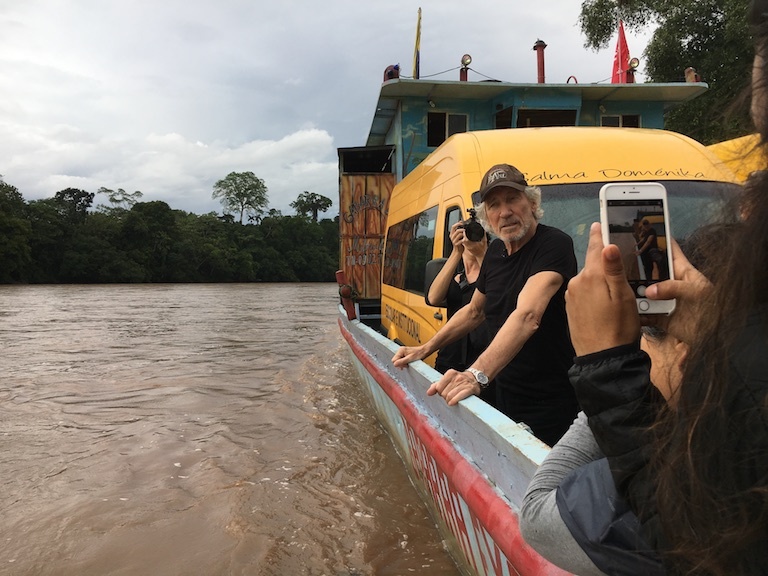 Roger Waters, former bassist and songwriter for the band Pink Floyd, visited the town of Lago Agrio this November to support Amazon communities in their legal fight against U.S. oil company Chevron, now in its 25th year. Image by Dan Collyns for Mongabay. In Aboquehuira, three hours by motorized canoe downriver from Lago Agrio, the Aguarico River was once the wellspring of life. Now the Siona indigenous people living in this village say it has become a source of pollution and disease. So they have turned away from the river and figured out another source of water. By gathering the rain through catchment systems and filtering it until it’s fresh and potable, they are tackling the most fundamental problems faced by thousands of families living downstream from oil drilling. 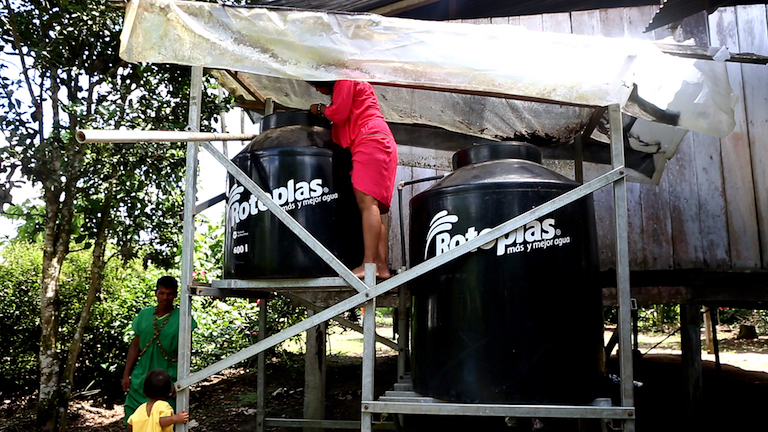 Flor Tangoy inspects the filtration tank in a rainwater catchment system in her village of Aboquehuira in the Ecuadoran Amazon. Image by Dan Collyns for Mongabay. So far the Siona and other indigenous communities have installed 1,164 water systems in more than 70 villages, as part of the San Francisco-based NGO Amazon Frontlines’ Clearwater project. Rain-harvested water is cleaner than local surface water, according to the project’s research. The rainwater here is gathered the way it is almost everywhere, flowing from rooftop gutters. But before the water goes into the tank it passes through a specially designed four-layer filter. The top layer contains microorganisms that trap contaminants, kill bacteria and break down organic material. The second layer contains fine sand that traps petroleum pollution, toxic heavy metals, microbes and other contaminants. This job is backed up by the third layer, of crushed quartz. At the bottom, a layer of gravel supports the sand and quartz layers as the clean water flows into a second, large anti-bacterial storage tank. The system ensures the villages have an abundant flow of safe, clean water to drink and bathe in. In a recent survey by Amazon Frontlines of 62 households with the domestic rainwater harvesting systems, 86 percent of the respondents reported improved digestive health (less diarrhea, vomiting and stomach pain). None of the drinking water samples had detectable levels of the heavy metals mercury or lead, or polycyclic aromatic hydrocarbons (PAHs) that are typical of oil pollution. 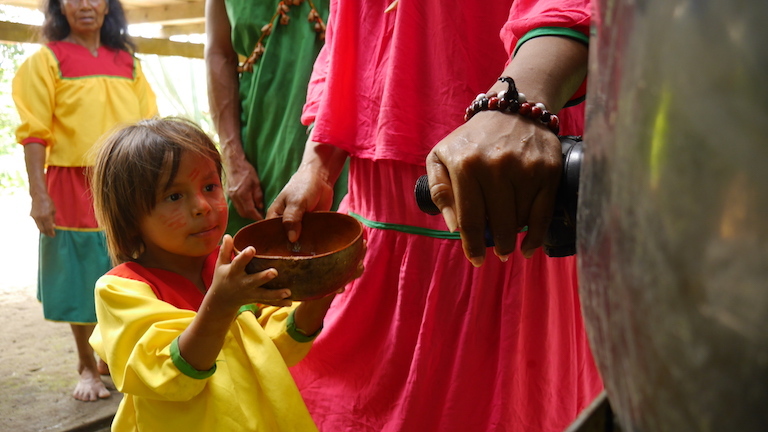 A child receives clean drinking water from a rain catchment tank in Aboquehuira, a village of the Siona indigenous people whose traditional water source is contaminated. Image by Dan Collyns for Mongabay. Mitch Anderson, Amazon Frontlines’ executive director, has been working with the Ceibo Alliance, an advocacy group comprising the Siona, Secoya, Kofan and Waorani, to help them forge a path around their pollution problems. Flor Tangoy, 36, grew up in Aboquehuira and is now a Ceibo Alliance leader, as is Nenquimo. The water tanks have dramatically improved her village’s living standards, she said. Habits have had to change, she accepts. Until recently her people not only bathed in but drank the water from the river and streams. 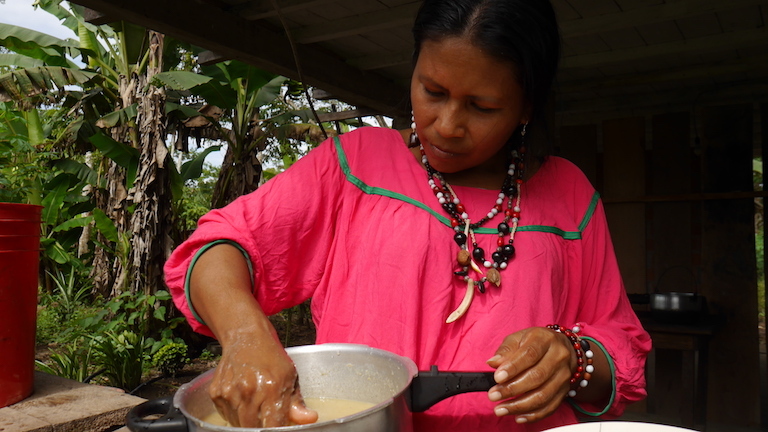 Flor Tangoy makes a mildly alcoholic drink called chicha from fermented plantains and water from a rain catchment system. Image by Dan Collyns for Mongabay. Along with a water tank, almost every home in Aboquehuira also has solar panels. Amazon Frontlines and Ceibo Alliance have installed the panels in 16 indigenous communities so far. The electricity they produce can power cellphones or radios directly during the day, or charge batteries that run LED lights and televisions at night. 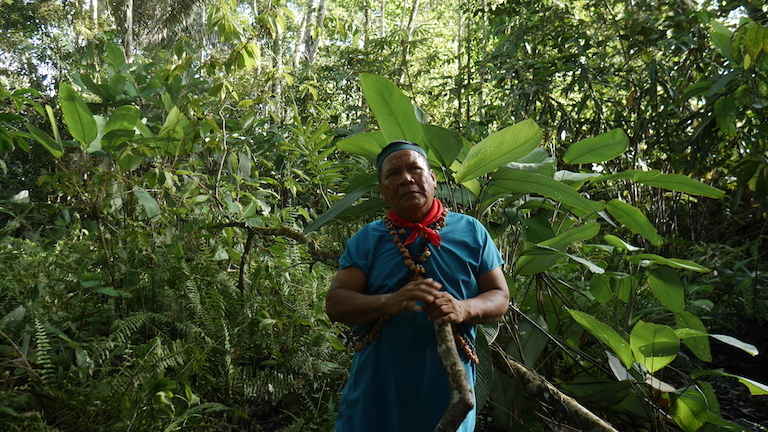 Emergildo Criollo, 59, is an indigenous Kofan. His village, Babure, like many indigenous villages in the region, lights up at night. The solar panels produce enough energy to power a television in his wooden home perched on stilts. As dusk falls, his granddaughter reads at the table while the neighbor’s 6-year-old girl lolls in a hammock watching the flickering TV screen. “My grandchildren do their homework at home and we don’t need to use generators,” Criollo said proudly. Most Amazon communities are off the grid and rely on generators. Once revved up they whir away, gulping down gasoline, which is not only expensive, Criollo said, but produced by oil companies that operate locally. 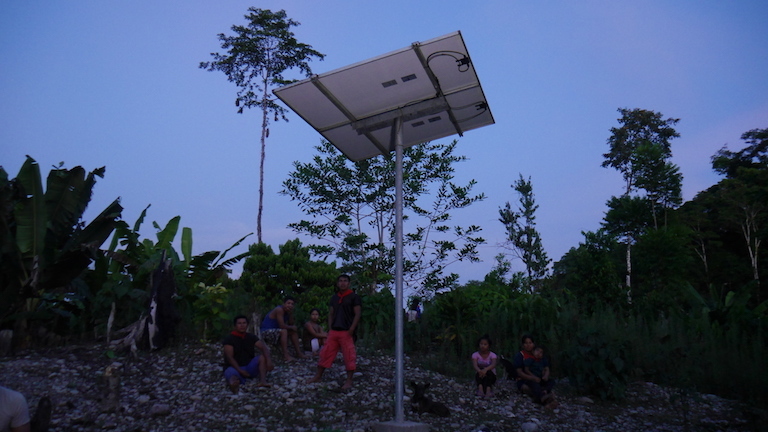 A solar panel in Babure, a village of the Kofan indigenous people, at dusk. Image by Dan Collyns for Mongabay. Criollo wants nothing to do with oil and its byproducts. The industry has brought him nothing but pain, he said. He was born before the oil boom and his first brush with outsiders was with oil workers. Emergildo Criollo, an indigenous Kofan, digs up crude oil hidden from view in a rainforest swamp near Lago Agrio, Ecuador. Image by Dan Collyns for Mongabay. Criollo said he was 16 years old when his first child was born. “When my wife was pregnant she drank polluted water without knowing it and after she gave birth my first child could not grow properly. When he was six months we took him to the local clinic, then to the capital Quito, but after all the tests my firstborn died,” he said. His voice broke as he retold the story he must have told to dozens of journalists over the years. Some years later, Criollo’s second child died, too, at age 3. The cause, he believes, was bathing in and drinking contaminated water. Devastated, Criollo learned Spanish and how to fight for his people’s rights. “The company came to destroy our jungle, to pollute our rivers and environment, to give us new diseases that we never had before, and death. That’s what we’ve got from the company,” he said. 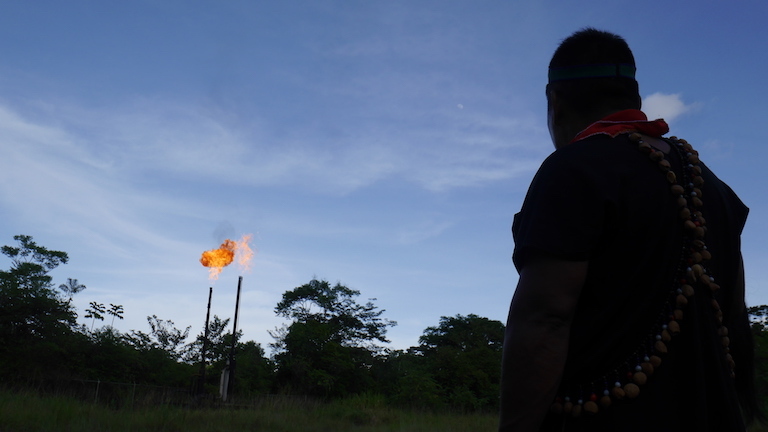 Emergildo Criollo looks at a gas flare near an oil refinery some 32 kilometers (20 miles) from Lago Agrio, at dusk. The flares, a common sight in the region, burn off gas from piped oil. Image by Dan Collyns for Mongabay. Dan Collyns is a multimedia journalist covering Latin America, mostly based in Peru. He reports on topics from politics to sports, with a special interest in the environment and human rights. Correction 1/4/19: The original version of this story misspelled Flor Tangoy’s surname. It has now been corrected. We regret the error.